In 2015, the entire world watched the return of Star Wars, one of the greatest and most beloved cinematic sci-fi series, back on the big screen with the much celebrated seventh roman numeral installment titled The Force Awakens being the newest entry in this epic saga. This highly anticipated film came after Disney’s acquisition of Lucasfilms, which planned to take the Star Wars saga in a new direction, presenting a brand-new trilogy beyond Episode VI: The Return of the Jedi as well as expanding the Star Wars cinematic universe beyond the signature episodic feature films. Many fans and moviegoers were skeptic, but eagerly waited to catch what lay in store for Star Wars: Episode ViII (The Force Awakens). Directed by J.J. Abrams, the film itself, which took place roughly thirty years after Return of the Jedi, followed a new generation of heroes (Rey, Finn, and Po) that, along with some old favorites, battle against the ruthless First Order, including the powerful Sith warrior Kylo Ren. In a nutshell, the movie had plenty of classic Star Wars nostalgia for fans to love; a blending of the old saying “something old, something new”, with all the right nuances of Lightsabers, Stormtroopers, aerial dogfights, and the mystical powers of “The Force” as well creating a new entry point for this third trilogy within Star Wars. While many praised the film, the movie was also criticized by many for being too similar to Episode VI: A New Hope (in terms of narrative / plot progression. Regardless if loved it or just thought it was okay, The Force Awakens was a huge success at the box office, with the film raking well over $2 billion worldwide against its $245 million production budget. This, of course, put Disney on the path to proceed with its further its idea of expanding the Star Wars universe with Rogue One: A Star Wars Story, the franchise’s first non-roman numeral feature spin-off, in 2016, which acted as a welcome addition to the Star Wars cinematic universe as well as acting as “pit stop” for its avid fans and moviegoers for the next episode installment to take shape the following year. Now, with the year of 2017 drawing to a close, Disney (Lucasfilms) and director Rian Johnson prepare for the highly anticipated eighth chapter in the Star Wars saga with film Star Wars: The Last Jedi. With a new director at the helm, does this latest entry elevate Disney’s new trilogy in the franchise or does it fail to meet the already extremely high expectations for this beloved saga? Following the events of The Force Awakens, The First Order, with the Republic destroyed by Starkiller Base, begins to take over the galaxy under the leadership of Supreme Leader Snoke (Andy Serkis). As his military right hand, General Hux (Domhnall Gleeson) scour the systems, on the hunt to snuff out General Leia Organa (Carrie Fisher) and her dwindling Resistance forces, including hotshot fighter pilot Poe Dameron (Oscar Isaac) and his trusted droid, BB-8. 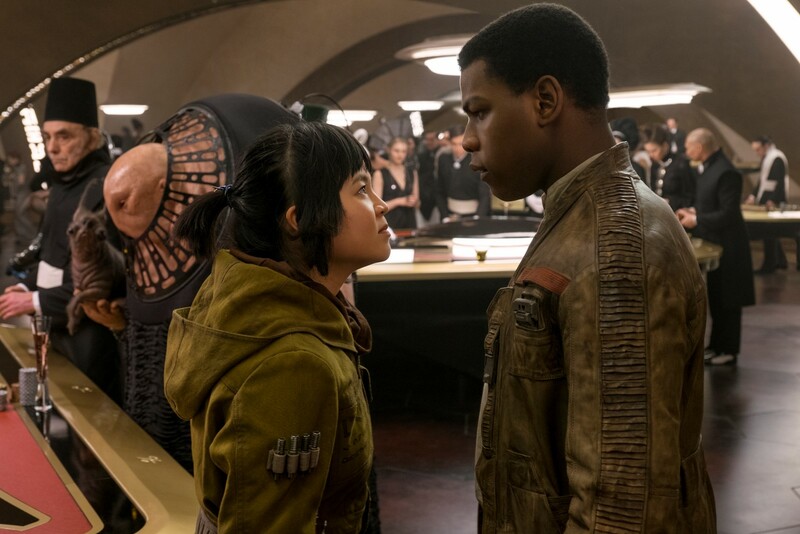 Awakened and healed from his battle wounds, Finn (John Boyega) is eager to do his part in the Resistance, teaming up with Rose, (Kelly Marie Tran), a maintenance worker, to infiltrate The First Order’s flagship and disable their systems, with their mission first leaning them to find a “codebreaker” on the planet of Canto Bight. Elsewhere, Rey (Daisy Ridley) is off on her own mission with Chewbacca, arriving on Ahch-To to persuade Jedi Master Luke Skywalker (Mark Hamill) to return to power, demanding he returns with her to fight in the coming days against The First Order and the rise of Kylo Ren (Adam Driver). Unfortunately, Luke isn’t interested in fighting, conflicted with his emotional concerns of the end of the Jedi order, but eventually agrees to help train Rey as she gets used to her newfound awareness of “The Force”. However, Luke sense an ambiguous power within Rey, which he saw once before in Kylo Ren, and tests his understanding in Rey’s tutelage, while Kylo Ren is conflicted as well, caught between his light and dark side of The Force. As the forces of The First Order slowly close on in to the Resistance, it’s up to the heroes to band together, making sure that their “spark of hope” ignites a call to arms and that the rebellion lives on. Like many out there, I grew up watching Star Wars. I didn’t have any of the action figures or anything like that, but my childhood is filled with watching cherished sci-fi saga on its various media outlets (VHS, DVD, and eventually Blu-Ray). Of course, given my age, I grew up watch the original trilogy first and, of course, the prequel trilogy when they came out. Naturally, the original trilogy I found to be better of the two, but I have learned to appreciate the prequel trilogy more than most. Anyway, I remember hearing about Disney’s acquisition of Lucasfilm a few years back and the inherit grumblings from fans on how they (Disney) was planning a new Star Wars trilogy, with the then untitled Episode VII set to continue after the events of The Return of the Jedi. Eventually, the cast was revealed, official imagery was released online, and the film’s marketing campaign (movie trailers, TV spots, and other promos) flooded the world wide web, causing much anticipation towards the release of this feature film. As I stated above, The Force Awakens was generally received positively by many, with most criticism facing in its similar narrative beats from A New Hope. Personally, I did like The Force Awakens as it had a lot of fun and Star Wars nostalgia within its context (proving to be a good starting point for a new trilogy), but I still couldn’t shake off the fact of the story in The Force Awakens sharing too many similarities to A New Hope, which did kind of put a damper on things (just slightly so). Still, love it or hate it, The Force Awakens was a box office success and was a big win for the Star Wars brand underneath Disney’s banner. This was even made more clearly when Disney’s first solo Star Wars film Rogue One: A Star Wars Story premiered the following year and blew many critics and fans (including myself) away with its captivating story, proof that the “House of Mouse” was capable of handing this beloved cinematic saga. This, of course, leads me to my current review for the highly anticipated eighth roman numerical episode in the franchise Star Wars: The Last Jedi. Like many, I was definitely curious to see how this movie would ultimately play out. Would it take a new route in challenge the status quo of the series or would it follow in the same footsteps as The Force Awakens did and be a somewhat rehash of Episode V: The Empire Strikes Back? With all the movie news and marketing promos being slowly released online for this new film, this question (and several others) were debated and talked about on various media outlets; ultimately trying to uncover the answer of if, whether or not, will The Last Jedi live up to its hype? I, too asked this question myself, but was optimistic about Episode VIII and looked forward to seeing what director Rian Johnson would be able to present in Star Wars film. So, now…the big question…. did The Last Jedi live up to its anticipated hype? What did I think of the movie? In a nutshell, yes it does. While it does stumble with a few missteps, Star Wars: The Last Jedi proves to be an effective (and solid) continuation to this new saga, building upon its history mythos for a higher-stakes adventure and expansive installment that has plenty of surprises and familiar nuances. Just like Luke Skywalker says in the movie “this is not going to go the way you think” and he’s right about that. While J.J. Abrams directed The Force Awakens, director Rian Johnson, whose previous directorial works includes Looper, Brick, and The Brothers Bloom, takes over to helm Episode VIII: The Last Jedi. Perhaps one of the greatest things that Johnson does is to sort of “shake up” fans and moviegoer’s expectations for what The Last Jedi would be. To be truthful, Abrams had a difficult challenge of creating a new saga to an already finished narrative, but Johnson has the more difficult task of continuing the narrative thread that began in The Force Awakens as well as trying to infuse his own filmmaking style and avoid the missteps taking by Abrams in the previous episode feature. To that effect, Johnson succeeds and succeeds greatly at, especially when comparing this film to Abram’s The Force Awakens. There’s a several big twists and turns in The Last Jedi, which keeps the film from being formulaic and predictable and adds some fresh elements to the proceedings. To be honest, there were a few times that I was expecting one thing to happen in one scene, but then something completely different happens in the next scene, which is something of a surprise to me (and definitely a win in the film’s positive category). It also helps that Johnson penned the film’s screenplay, which contributes to the unexpected harmony in both filmmaking and story being told in The Last Jedi. This, of course, means that Johnson still brings in all the classic Star Wars elements to the film, especially the thematic light side / dark side (i.e. good vs. evil) confrontation, which is a main staple in the franchises mythos. Johnson doesn’t go overboard with that notion (much like what Abrams did in The Force Awakens), but those ideals are prevalent in roots of this cinematic space opera. Additionally, Johnson makes The Last Jedi feel bigger “in its scope” and adds more “weight” to overall stakes being told throughout the narrative. Rather than jumping from one planet location to the next across the galaxy (even though the movie slightly does that when shifting to certain characters), Johnson keeps the focus one central point for most of the movie as the Resistance is fleeing from The First Order’s encroaching fleet. There’s a sense of desperation and a “time crunch”, which adds more to the dramatic tension and keeps the stakes high for the characters that are involved. Johnson also succeeds in capturing the Rey / Luke storyline thread, which is where the film shines the best and is the crucial part in The Last Jedi’s narrative (but more on that when I talk about the actors / actresses below). In short, Johnson does wonder in sort of reinvigorating a viewer’s expectations of watching a Star Wars film, finding The Last Jedi to be unique and impressive feature from start to finish in both familiar tones and creative turns. In terms of technical filmmaking presentation, The Last Jedi is a beautiful blockbuster endeavor that any viewer can obviously tell had a lot of money put into it. The production quality is high as various set productions and off-site locations are exquisitely detailed and offer plenty of eye-popping moments as its easy to get distracted in the film’s background settings range from the luxurious casino nightlife of Canto Bight to the ancient / desolate (almost mystical) Ahch-To or to even Supreme Leader Snoke’s hallowed throne room. So, hats off to the film’s production designer Rick Heinrichs for doing such of amazing job in bring us (the viewers) to a galaxy far, far away in The Last Jedi. Additionally, costume designer Michael Kaplan must be mentioned for his wide array of costume apparel outfits for each of the characters as well as the film’s cinematographer Steve Yedlin must be mentioned (and praised) as The Last Jedi has plenty of wonderful cinematic sequences, especially the scenes that take place on Crait, a salt-mineral planet that’s covered in white salt with blood red ground underneath. The film’s visuals are also a highlight, capitalizing on the sci-fi setting of Star Wars from its usage in bring this grand tale to life where practical effects could not. Although there are a few moments where CG effects are a bit sloppy / noticeable, the overall visual effect shots are great and aid in this blockbuster adventure. This also extends to the various new creatures that appear in The Last Jedi, including the adorably cute Porgs on Ahch-To and the crystalline foxes on Crait, which are a mixture of CGI effects and / or practical effects (i.e. puppetry). As a side-note, keeping up with the tone of The Force Awakens and Rogue One: A Star Wars Story, The Last Jedi doesn’t go overboard with its CG visuals (much like the prequel trilogy did), which is a good thing. While he missed out in scoring Rogue One: A Star Wars Story, legendary film composer John Williams returns to compose the music for The Last Jedi, with Williams’s eighth composition Star Wars feature bring forth all the iconic melodies from past entries as well as providing a beautiful musical backdrop for the entire movie. Whether its during a thunderous battle sequence or dramatic rousing scene, or even a soft moment of a character’s reflection / clarity, Williams’s score delivers a soul-stirring experience, befitting such a grandiose sci-fi adventure. As solid and entertaining as the film is, The Last Jedi does have some pitfalls / missteps that make the feature out of reach from being the “greatest” in its own cinematic saga. Perhaps the most notable is within its runtime and narrative structure. With a runtime of two hours and thirty minutes long, The Last Jedi is longest Star Wars film in the entire franchise. Its definitely noticeable as the feature is jammed packed with story content, most notable in the film’s second act, which feels stretched out. I’m not saying that the stories being told during this portion of the movie are generally bad, but most of the storylines told during this part (i.e. The Resistance outrunning The First Order, Po butting heads with Vice Admiral Holdo, and Finn and Rose’s venture to Canto Bight) could’ve been trimmed down slightly for a leaner (and shorter) runtime. Additionally, the movie seems to be build to a certain point (where the film’s climatic ending would take place), but it just keeps going for another twenty minutes. To be truthful, one of the storylines threads doesn’t really go anywhere. It does have a point to it, but seems a bit thin and really doesn’t have that much impact to The Last Jedi narrative (as a whole), only to develop a character arc between two individuals. Lastly, and I do have to admit it, the film does have several big and glaring WTF questionable moments that are left unanswered and / or left me confused by their ultimate decision. I wouldn’t go into detail what they are (as that would spoil the movie), but suffice to say that these moments will probably leave you perplexed as The Last Jedi presents more questions than answers. Yes, I do understand that Johnson wants the viewers to be kept “on their toes” and expect the unexpected while watching his movie and that this is the second installment in a trilogy, so I know that the third entry (Episode IX) will presumably answer all those questions, but still… a film should have you scratching your head by the time the film’s credits begin to roll. Also, there’s one scene that you will have you rolling your eyes and saying “oh, come on!” in disbelief. Most of these are minor negative criticisms (to me at least), but it might affect some viewers a bit more, which might hinder the movie in their open eyes. While The Last Jedi brims with sci-fi action of aerial dogfights in space and other various vehicles and is set to a large story canvas, the movie itself is rooted in theatrical and compelling character drama, which are well-acted by the many actors and actresses respectfully. Of course, leading the charge as this new trilogy’s main protagonist character is Rey, who is played by actress Daisy Ridley. Known for her roles in Scrawl and Murder on the Orient Express, Ridley continues to do tremendous work in her performance of Rey, the youthful scavenger from Jakku who bares a strong “force” power within her. Ridley seems more comfortable in The Last Jedi, with her being more adept in her character’s persona as well as bringing her own charm and stoic heroism to the role. Naturally, the big highlight of the feature is the return of actor Mark Hamill in his iconic role of Jedi Master Luke Skywalker. Unlike Harrison Ford’s return to Hans Solo in The Force Awakens, Hamill, known for his roles in the original Star Wars trilogy as well as providing voiceover work for various animation projects (i.e. Batman: The Animated Series, Avatar: The Last AIrbender, etc. ), is very much a different version of Luke Skywalker in this movie than what fans will remember. Gone is stalwart / noble hero-like archetype character we saw in The Return of the Jedi, with Skywalker being a tortured individual Jedi hermit, damage deeply by the events of when he was training Kylo Ren and the overall decline of the Jedi Order. 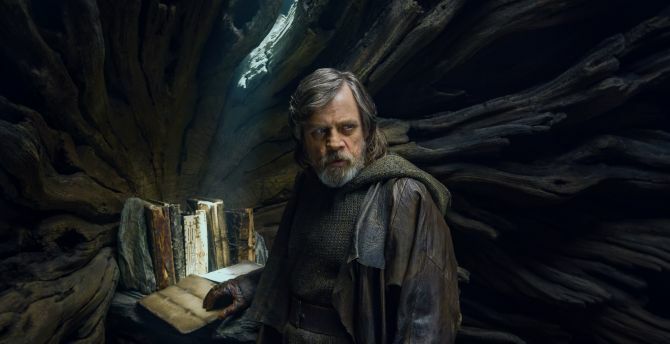 Hamill, of course, rise to the challenge of this new character arc / persona and handles it beautifully, finding the horror in confront Luke’s past as well as finding the difficulty in his training of Rey (of what it might bring) in the present. Thus, Hamill’s Skywalker is tonally different from past iterations of the Star Wars character, but it’s a fantastic and juicy role for him to play in The Last Jedi, which is memorable that will leave many (if not all) viewers completely satisfied. As stated above, the scenes revolving around Rey and Luke are some of the best scenes that the film has to offer, with Ridley and Hamill playing off each other quite well, be it comedic levity scenes or some dramatic ones (most of them). Coinciding with Rey’s narrative is Kylo Ren, the other “force wielding” new character in this new Star Wars saga, who is played by actor Adam Driver. Known for his roles in Logan Lucky, Girls, and Silence, Driver continues to display the tortured / psychotic ways of Kylo Ren, shedding his Darth Vader-like mask and showcasing the conflicted manner of wanting to become better and to please his master Supreme Leader Snoke. Much like Rey, he too is having problems with his parentage and wanting to shape his own destinies. Thus, the story arc between Rey and Kylo continues to evolve, especially when Ridley and Driver share screen time. In a nutshell, Driver actually does better in portraying Kylo Ren in this movie than in The Force Awakens. The other two main characters of this new Star Wars trilogy, Poe and Finn, are each afforded their moments to shine in The Last Jedi, with actors John Boyega and Oscar Isaac reprising their roles. Boyega, known for his roles in Attack the Block, The Circle, and Detroit, continues to present Finn with the right amount of humor and depth as the reluctant First Order Stormtrooper-turned Resistance fighter, facing trials that question his past life and seeing the harshness (and profits) made during wartimes. Likewise, Isaac, known for his roles in The Promise, Ex Machina, and X-Men: Apocalypse, gives Po Dameron a more headstrong “hotshot” bravado in this movie, facing challenges of what it means to be a hero and a leader. While these two respective characters aren’t quite as strong as Rey’s arc in the film, both Boyega and Isaac are well-talented actors and create solid Star Wars characters for viewers to get behind and root for, with each one bringing heart and humor to the narrative being told, which makes them memorable in their roles. In the villain category, The First Order ruler and Kylo Ren’s master, Supreme Leader Snoke, who is played by Andy Serkis (The Lord of the Rings trilogy and the new Planet of the Apes trilogy) gets more screen-time in The Last Jedi, with the character (physically) being a part of the story. While we get to his true power in the film, his disfigured appearance is hauntingly cool, and Serkis’s voicework for him is awesome, the character doesn’t get utilized to his full potential and does (in a nutshell) get shortchanged, which is sad because I kind of want to know more about him. The same can be said with the character of General Hux, who is played by Domhnall Gleeson (Goodbye, Christopher Robin and Ex Machina). Gleeson hams it up in his performance (and I think he knows that), but there’s really no depth to the character beyond him being right hand general to Snoke (and to The First Order). Lastly, actress Gwendoline Christie (HBO’s Game of Thrones and The Hunger Games: Mockingjay Part 2) returns as the First Order’s Commander Stormtrooper Captain Phasma (yes, she survived the trash compactor). Phasma’s return is small, but still effective, especially in Finn’s story arc in The Last Jedi. Of the new characters presented in The Last Jedi, the most notable one is the character of Rose Tico, the quirky lowly maintenance worker, who is played by actress Kelly Marie Tran (Untouchable and Ladies Like Us). Rose plays a part in Finn’s story arc in traveling to Canto Bight and does have a sizeable standout part made for her, with Tran up to the task in making her character likeable for this film (and possible Episode IX). The second new character is the codebreaker hacker named DJ, who is played actor Benicio Del Toro (Guardians of the Galaxy and Sicario). While only serving a purpose for a plot point, Del Toro makes the scrupulous character his own and is fun large cameo-like appearance. Some people have complained that he was underutilized, but I didn’t think so and really didn’t expect his character to be anything more than what was presented in the film. Lastly, actress Laura Dern (Jurassic Park and The Founder) plays the new character of Vice Admiral Amilyn Holdo, a high-ranking official in the Resistance. Much like what I said about Del Toro’s DJ, Holdo is mostly a gear in the narrative mechanics, but Dern gives her own spin of the character, which makes role in the film memorable. Naturally, I couldn’t forget to mention actress Carrie Fisher’s final performance of the iconic General Leia Organa in The Last Jedi, who unfortunately passed away shortly after completing her scenes for this movie. With that knowledge, her performance in this film is somewhat bittersweet and proves to have some of the best “resistance” based scenes, giving off some of her wry humor and demeanor of dealing with difficult situation as well as dealing with youthful individuals, like Po Dameron. Like I said, its bittersweet to say goodbye to her character as the film ends with plenty of room for Leia to be a part of Episode IX’s story, but that’s sadly won’t come to pass. I assume that they’re going to do something similar to what actor Phillip Seymour Hoffman in The Hunger Games: Mockingjay Part 2 to her (i.e. making an excuse for her absence in the film). In the end, The Last Jedi gives us Fisher’s final performance and its worth a teardrop or two to say goodbye to her. Whether Princess or General, Fisher…will be missed and, borrowing the lines from The Force Awakens “To me, she is royalty”. Lastly, familiar Star Wars characters (i.e. C-3PO, R2-D2, BB-8, Chewbacca, and few others) are scattered across The Last Jedi in small supporting / cameo-like roles. Their involvement in the movie’s overall story may by vital (at times), but these fan-favorites are mostly delegated to filling out the background, with a few moments to shine here and there. Still, the continuity of their appearance is a welcomed one. One notable flaw i found within this new Star Wars trilogy is that it seems a bit disjointed. While George Lucas oversaw and laid out the narrative map for both his original Star Wars trilogy (Episodes 4, 5, and 6) and the prequel Star Wars trilogy (Episodes 1, 2, and 3), this new Star Wars trilogy seems to be having a difficult time to find its tone. The reasons for this is probably the exchange of directors with J. J. Abrams directing Episode 7 (and Episode 9) and Rian Johnson directing this movie (Episode 8). Like all movies, each director has “vision” of what the movie would be and, when it comes to directing a sequel and / or continuation franchise film, the new director might changed certain things from the previous films in order to make the film to what he deemed to his “vision”. A viewer can definitely see that in The Last Jedi, with Johnson changing certain things from Abrams’s The Force Awakens, but the film’s two narratives (whether good or bad) has a hard time connecting at certain points. Basically, this new Star Wars trilogy, in comparison to the two previous trilogies, doesn’t seem to flow correctly with a one unified voice. Tactical maneuvers, decisive decisions, and the balance of both the light and the dark side of the Force is tested in the sci-fi film Star Wars: The Last Jedi. Director Rian Johnson’s newest movie brings the eighth roman numeral entry in this beloved franchise to new heights, creating a feature that has all the best part of a Star Wars movie as well as keeping the tale fresh with several new twists and turns within the narrative. While the film is bloated with too much going on and does dish out more questions than answers, the film succeeds in meeting high expectations, delivering fantastic entry in the Star Wars saga by expanding its own mythos and giving some new dynamic elements to some of its characters (including the cast). Personally, I really liked this movie. It wasn’t my favorite Star Wars movie and it did have some small problems here and there, but the movie itself was immensely satisfying and I was happily entertained in this newest episodic chapter of Star Wars. Additionally, I personally think the movie improved on what was established in The Force Awakens. Thus, my recommendations for this movie is a definite “highly recommended” for viewing, especially if you’re a fan of the franchise or even just a causal moviegoer wanting to check the film to see if it’s worth the hype (which it is). All in all, Star Wars: The Last Jedi elevates this sci-fi / fantasy saga in new ways and to new heights, setting the stage for a climatic ending to this adventure and setting even higher expectations for J.J. Abrams’s return to the trilogy for the now untitled Episode IX. Definitely agree with your final thoughts on this! Interesting. I felt that the 2 movies have been moving along a little slowly. Maybe this series might not be able to be concluded with one trilogy. To be honest, i somewhat agree with you. TFA and TLJ are a bit slower than the other Star Wars movies, but I still have enjoyed them. Enjoyed them as well I have. But….some parts of TLJ has been a bit…..ehh….strange for the development of the series. For example Snoke…..wished he played a bigger role. We still don’t know who he is, where he came from and what he is. And Phasma too, I wished there was a little more develeopment for her. Well said! While there are minor issues, and some WTF questions left unanswered, Episode is by large a winner. For me, it’s the best SW movies I’ve watched to date.